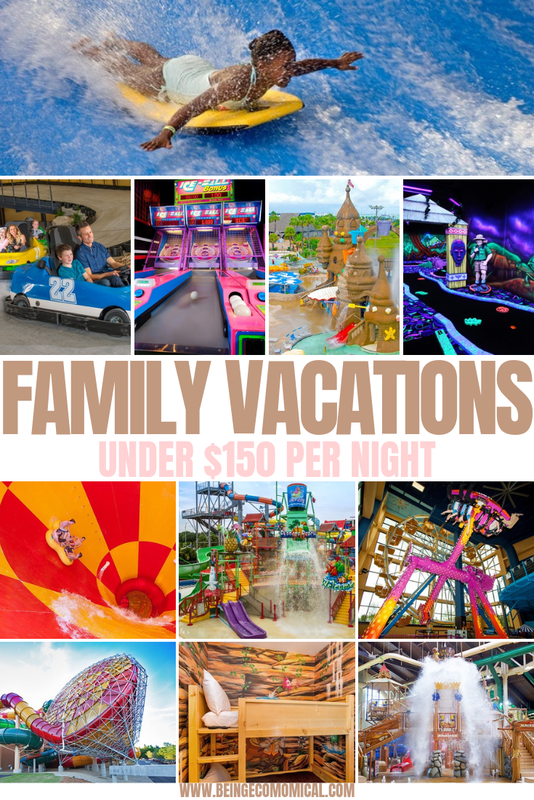 Now that Spring time is here, it's time to start planning those epic family adventures for the Summer! It's such an exciting time of the year to kick back and enjoy yourselves with the ones you love and with these deals, it's the perfect chance to go on plenty of adventures without hurting your pockets. 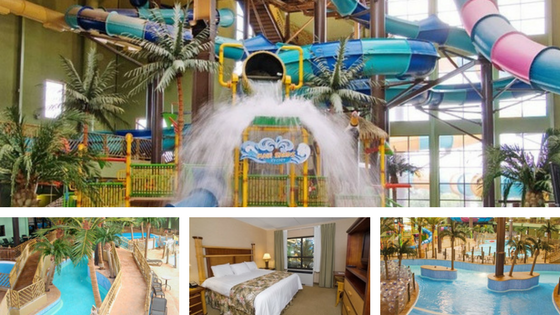 From $54 per night, you get to enjoy the resort's water park thrills with 14 slides and 3 heated pools. Youngsters get to let loose at the Parrots Perch water playground. Enjoy modern and spacious guests rooms with Wifi, flat screens, and mini fridges. Over 6,500 square feet of arcade games. Scheduled shuttle service that takes guests to Universal Orlando Resort, SeaWorld Orlando, and Aquatica. 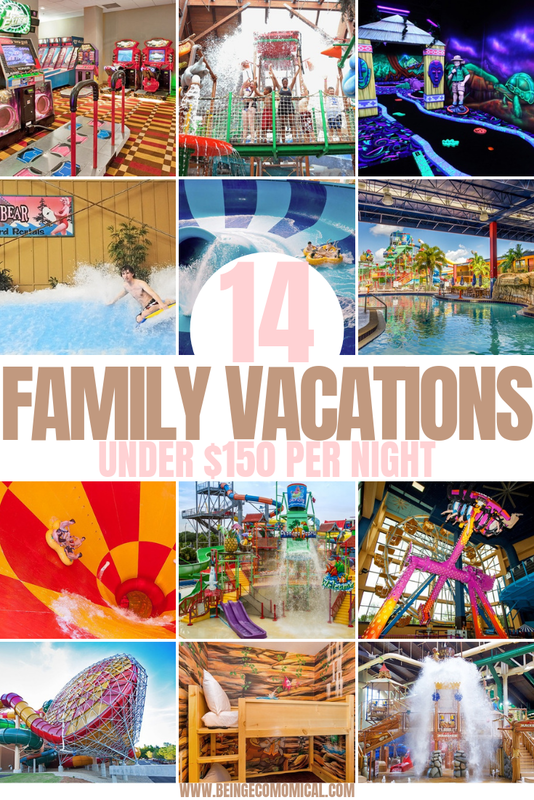 A $15 discounted resort fee is included, which includes water park passes for 4 and access to all hotels amenities. Enjoy a bite at the tropical Tradewinds restaurant and the family-friendly Callaloo Grille or CoCo's Pizzeria. Enjoy several on-site dining options, ranging from the casual People's Choice food court to breakfast at the Vineyard Cafe'. Up to two children receive FREE breakfast per room, accompanied by a paying adult. 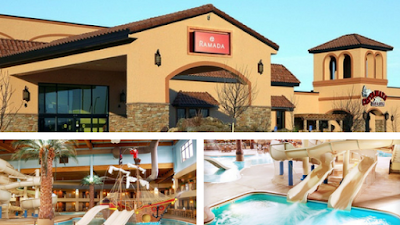 The hotel features two Olympic-style swimming pools, two jetted tubs, and one kiddie pool. Tennis court and sand volleyball also available. Complimentary movie every nigh in the on-site theater. Each room comes with WiFi, a microwave, and a mini fridge. Kids' suites have seperate themed areas for the little ones. From $75 per night, this villa offers all the conveniences you'd want for a family vacay. 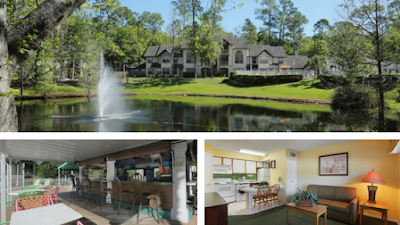 Elegant and spacious villas and a FREE shuttle to Orlando's biggest attractions- including Walt Disney World Theme Parks. Full breakfast buffet each morning (at additional costs). Two lagoon-style pools and one jetted tub. Also a separate kiddie pool. One and two bedroom villas accommodate up to four and eight guests. Lighted tennis and basketball courts and fitness center. 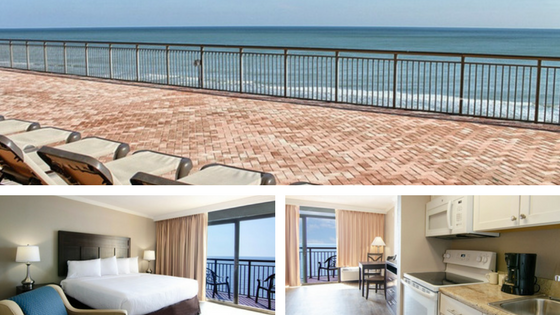 From $59 per night, enjoy this oceanfront resort which features a sun deck, plenty of dining options, and immediate access to the Atlantic Ocean. 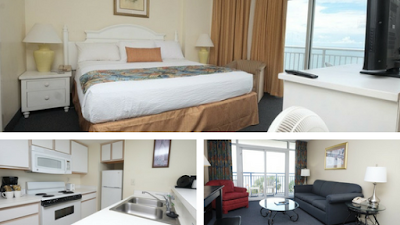 All guests rooms recently underwent a complete renovation with brand new floors and furnishings, an updated kitchen, and modern wall coverings, draperies, and bedding. Famous for one-block poolscape with full-sized and kiddie lazy rivers, a giant hot tub, and Wild Water Pool, complete with dump buckets, and spray fountains. Breakfast and seasonal dinner buffets available at the Santa Maria Restaurant. Also a seasonal ice-cream and sandwich shop and a pool grill on the property. The onsite golf department can book you tee time at any of the nearly 100 golf courses in Myrtle Beach. From $55 per night, enjoy condominiums where guests can relax and enjoy home-like amenities like a fully equipped kitchen, WiFi, flat screen TVs, and private oceanfront balconies. Enjoy an indoor pool, outdoor pool, or float in the lazy river. Outdoor and indoor hot tubs. 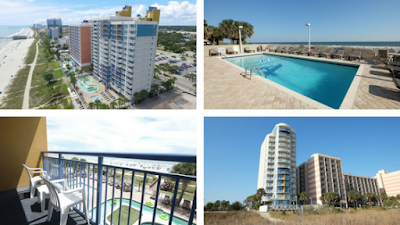 Steps away from Myrtle Beach. 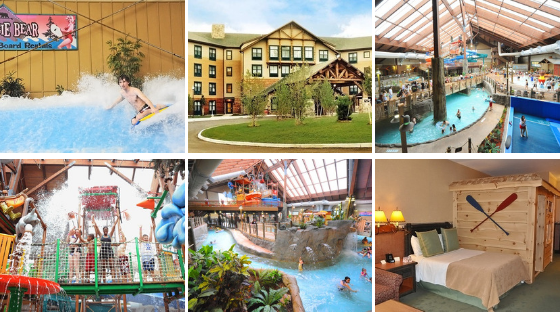 This hotel has both indoor and outdoor water parks with 24 water slides, rides, and river systems. 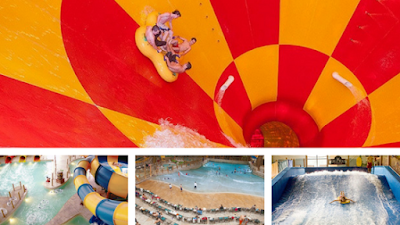 Water park passes for four are included with some options. 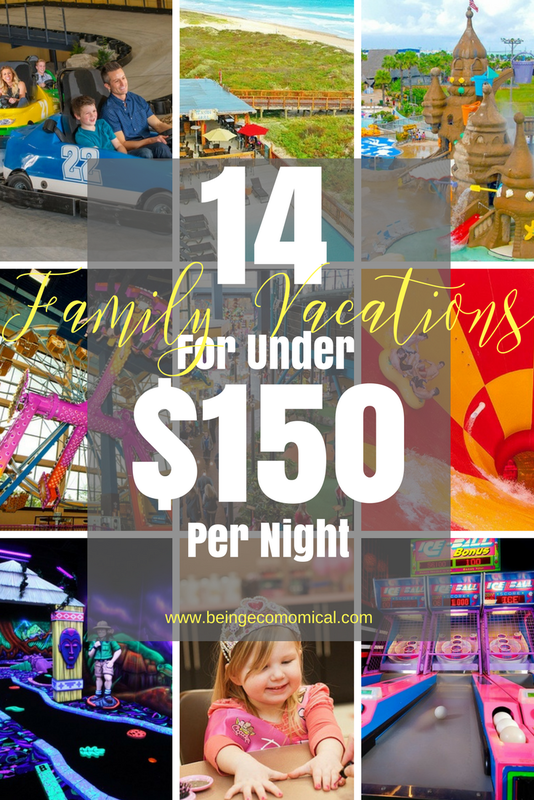 Includes a 1950's carousel and a gaming zone. Spacious guest rooms include mini fridges, microwaves, and flat-screen TVs. Seafood restaurants serving up the freshest shrimp and red snapper straight from the Gulf of Mexico. Enjoy cocktails at the swim-up bar. Fishing, boating, and horse-back riding can be planned at the front desk. From $99 a night, enjoy a stay in the starfish room. Stay in a comfy guest room that includes amenities such as flat-screen TVs, kitchenette equipment, a balcony and free WiFi. 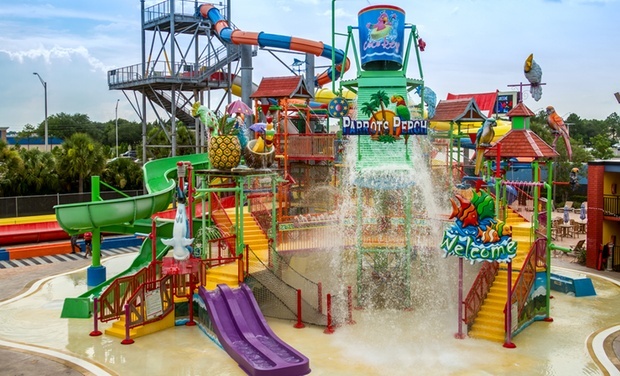 The price includes daily water park passes. Arcade with video games, air hockey, basketball and more. It's always 82 degrees! Stay for four in a traditional suite, Klub Moose Adriondack cabin, or Great Northern standard suite for less than $100 per night! Onsite spa for mom and dad, while kids tagalong and visit Cupcake Kids spa. 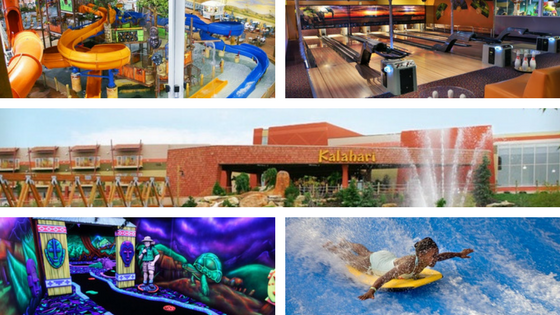 Dining options include Johnny Rockets, sports bar and a seasonal tavern serving breakfast. 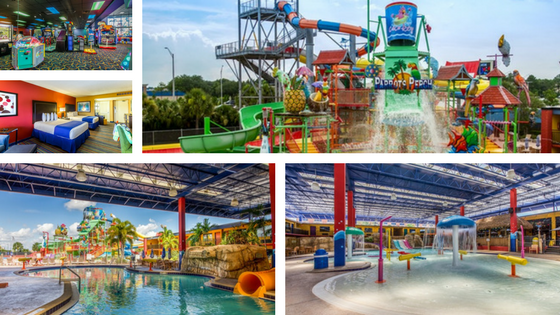 Try body surfing or take a stand-up surf lesson at Boogie Bear Surf, or visit Lotta-a-Watta-Bay to enjoy peaceful rock formations. 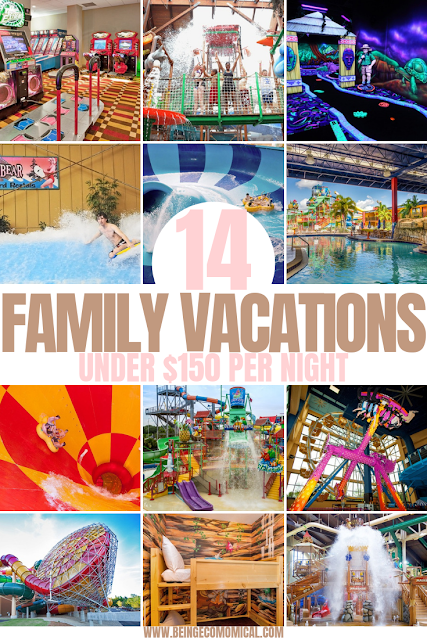 From $139 a night, enjoy more than 15 water rides and attractions spread across 174,000 square feet of aquatic fun. The indoor water park is among America's largest. A $100 credit per stay is included in your stay to enjoy the Big Game Room arcade. Black-light mini golf and mini bowling. 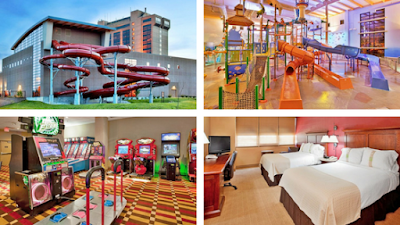 From $97 per night, enjoy 55,000 square feet of fun-filled space. Five-story Shark Slam water slide. 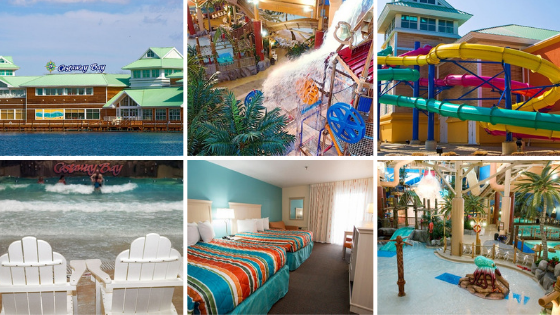 Stay includes up to four passes to enjoy time at the lazy river, and the aquatic jungle gym. Free WiFi and flat screen TVs. Have ice cream at the Wet Rooster Bar, or pizza at Gators Grab & Go. 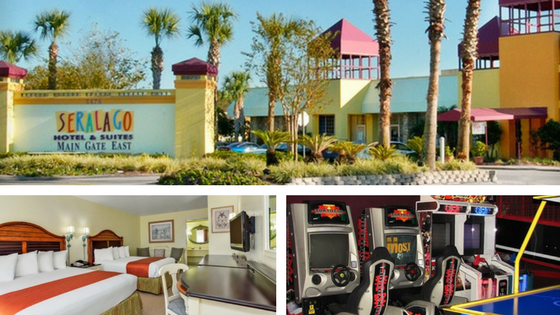 Stay includes a $25 arcade card that can be redeemed at the resort's arcade with over 50 games. Pet-friendly for an extra fee. 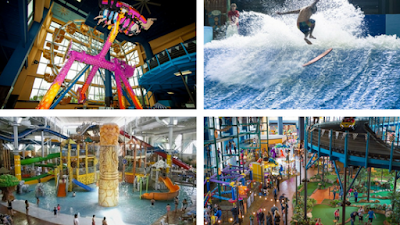 From $129 enjoy this 5,000 square foot indoor water park. Zip down the Victoria Falls raft ride, relax in the wave pool, or take a surf ride on the FlowRider. 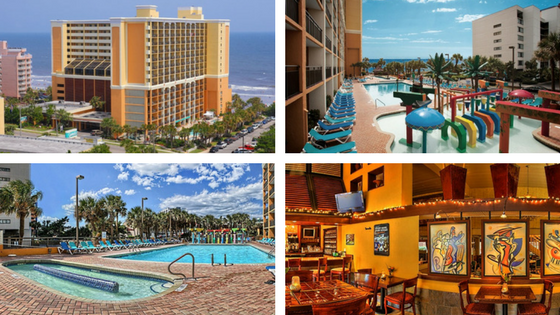 Stay includes passes to activities and standard rooms feature flat-screen TVs and microwaves. Onsite dining includes a pizza kitchen and a Brew pub. Enjoy included passes to bowling, go karts, mini golf, and much more. From $82 a night, enjoy 18,000 square feet of indoor water park with multiple slides, a pirate ship, a lap pool and a hot tub. 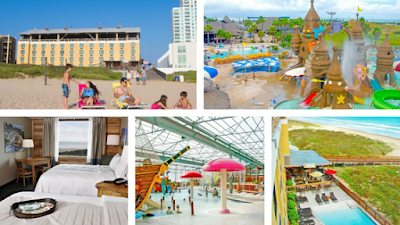 Complimentary WiFi, an arcade, a gift shop, a poolside tiki bar, and an onsite restaurant. Each room comes with two queen sized beds and a flat-screen TV. Enjoy a $30 dining credit. 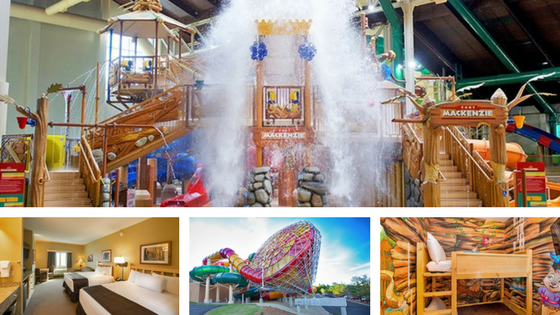 From $63 a night, enjoy an indoor water park, zoom down slides, float on a lazy river, and play in tree house with a dumping bucket. Onsite dining such as hotdogs, pizzas, and hamburgers. Room includes microwaves, fridge, WiFi, and flat screen TV. Onsite arcade, mini basketball, pool tables, and air hockey. From $129 a night, enjoy daily water park passes for each registered guest. 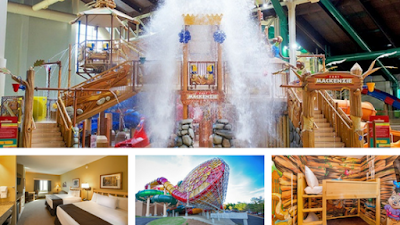 105,000 square-foot indoor water park that includes a four-story treehouse with a 1,000-gallon tipping bucket. Arcade with more than 100 games. Scooops Kids spa, complete with ice cream sundae pedicure chairs. Roomy suites that comfortably sleep up to six, seven, or even eight people. So many options here to choose from! I hope you all find something within your budget. Most of all, ENJOY!